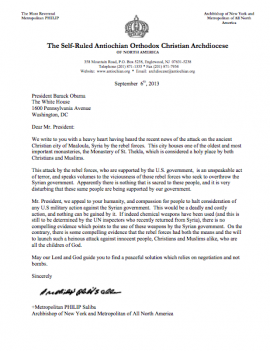 We write to you with a heavy heart having heard the recent news of the attack on the ancient Christian city of Maaloula, Syria by the rebel forces. This city houses one of the oldest and most important monasteries, the Monastery of St. Thekla, which is considered a holy place by both Christians and Muslims. This attack by the rebel forces, who are supported by the U.S. government, is an unspeakable act of terror, and speaks volumes to the viciousness of those rebel forces who seek to overthrow the Syrian government. Apparently there is nothing that is sacred to these people, and it is very disturbing that these same people are being supported by our government. Mr. President, we appeal to your humanity, and compassion for people to halt consideration of any U.S military action against the Syrian government. This would be a deadly and costly action, and nothing can be gained by it. If indeed chemical weapons have been used (and this is still to be determined by the UN inspectors who recently returned from Syria), there is no compelling evidence which points to the use of these weapons by the Syrian government. On the contrary, there is some compelling evidence that the rebel forces had both the means and the will to launch such a heinous attack against innocent people, Christians and Muslims alike, who are all the children of God. May our Lord and God guide you to find a peaceful solution which relies on negotiation and not bombs.